Hosted by the School for Environment and Sustainability (SEAS) at the University of Michigan, CIGLR is a partnership between the National Oceanic and Atmospheric Administration (NOAA), universities, non-governmental organizations, and businesses. Together, we work to achieve environmental, economic, and social sustainability in the Great Lakes. CIGLR consists of a Research Institute and a Regional Consortium. The CIGLR Research Institute complements NOAA’s workforce with a highly-skilled, permanent group of research scientists, postdoctoral fellows, technicians, and staff that expands NOAA’s research expertise and is fully-integrated into NOAA’s scientific enterprise. 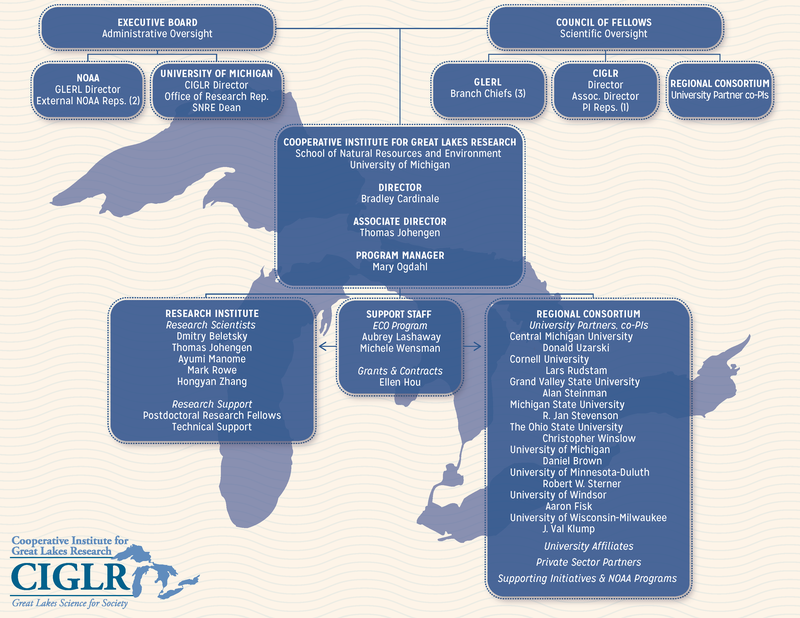 All CIGLR Research Institute personnel hold appointments at the University of Michigan and are collocated with our sponsor, the NOAA Great Lakes Environmental Research Lab (GLERL). CIGLR Research Scientists serve as principal investigators on CIGLR Cooperative Agreement (NOAA) and external proposals, engage in collaborative research with NOAA scientists and Regional Consortium partners, and mentor undergraduates, graduate students, and postdoctoral fellows. CIGLR postdoctoral fellows work with CIGLR and GLERL Research Scientists to receive early career training in NOAA mission-related research topics in the Great Lakes. CIGLR research support staff work with CIGLR and GLERL principal investigators on technical aspects of their research projects. The Regional Consortium broadens our research capacity, intellectual expertise, and geographic scope across the Great Lakes. Consortium partners include nine universities and six private sector organizations that collaborate with CIGLR and NOAA GLERL to conduct research, transition research to operations, and engage with stakeholders. Reviews, providing recommendations on, and approving CIGLR’s Strategic Plan. Makes recommendations to CIGLR’s Director concerning the administrative budget. Approves appointments for the Council of Fellows. Reviews the annual budget and progress report of the CI. Reviews agreements or addenda to CIGLR’s Cooperative Agreement, as may be entered into in the future, and making recommendations about such agreements to the Director. Reviews general policies of CIGLR and initiating appropriate recommendations. Assures that CIGLR maintains a basin-wide approach in the Great Lakes and fully engages the Regional Consortium in research, outreach, education, and communications. Provides leadership in maintaining high standards of research for the CI. Analyzes the CI’s programs and science direction, identifying critical research needs, and recommending new research foci. Advises CIGLR’s Director on selection of new Council of Fellows members and reappointment of current Fellows. Makes recommendations to the CIGLR Director on the selection of Visiting Fellows. Reviews grants and applications for non-administrative programs, including the Postdoctoral Fellowships, Visiting Fellows, and Graduate Research Fellowships, and making recommendations to the CIGLR Director about priority applicants.